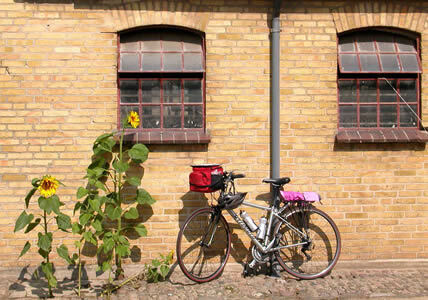 I don’t know many people who list Denmark as their absolute favorite tourist destination, yet with its modern design aesthetic, quiet charm, welcoming populace and unspoiled countryside, Denmark is a wonderful choice, especially for bike riding. I have recently taken up bike riding again, and so last summer my husband and I decided to take a cycling trip. We wanted to go with an experienced outfitting company that would make the arrangements for the hotels and meals, and provide the bikes, routes and logistics. Since we had traveled with Backroads www.backroads.com in the past and enjoyed our trips, we just went to the website and checked out bike trips to places we hadn’t been, that would accommodate our different riding styles, that sounded interesting and that fit our time schedule. We narrowed our choice to Denmark; we booked the trip, and with a few other reservations for planes and hotels before and after the trip, we were set. Denmark is a dichotomy. It’s a modern, sophisticated, industrialized country with the world’s highest taxes and the most even distribution of wealth among its citizens of any country. Yet, it has many rural islands, including Funen (called Fyn, in Danish). Although it is only two hours by train from Copenhagen, Funen is unspoiled, rural and picturesque and has rolling hills that provide enough interest, views and exercise. We spent a delightful, interesting and athletic week cycling on Funen. Biking in Denmark is wonderful. The Danes use bikes as a basic mode of transportation, so car drivers are used to seeing and being courteous to cyclists. We never had to worry about leaving our bikes unlocked anywhere. Even in Copenhagen, bikes were unlocked, although they were commuter “beater” bikes that few would really want. The people we met were English speaking, intelligent, urbane and, somewhat surprisingly, pro-American. We toured an old traditional mill run by a man who had lived there since World War II. He hadn’t forgotten the United States’ help during that time. During the Cold War, he and his fellow villagers installed a steel gate blocking the driveway to the mill “to keep the Soviets out.” When I asked what he would have done if the Soviets ran through the gate with a tank, he said that he would have waited for assistance from the Americans. We visited traditional water and wind mills. Our hotels were luxurious, because we chose the “Premiere Inn” level trip (as opposed to the “Casual Inns” trip). Each morning began with a delicious breakfast where the day’s bike route maps were given to us. Every day was focused on cycling, but it was interspersed with a morning and afternoon stop along the way at a sight of interest. Lunch was either an ample picnic prepared by our tour leaders or on our own at a café. We arrived at our hotel each day in time to relax a bit before our tremendous dinner…tremendous in both senses of the word…the food was excellent and the quantity was substantial. The calories expended during the day more than compensated for the large meal. The other upscale organized bike trips follow similar daily routines. We stopped at this traditional Danish thatched roof cottage. One of our more interesting stops along the way was a visit to Egeslov Slot, a 16th Century moated castle with a small museum and elaborate gardens and maze. One half of the castle is still occupied by its owners, Count and Countess Ahlefeldt-Laurvig-Bille. We also enjoyed a ferry excursion to the small island of Aerøskøbing. Although it is a tourist destination, the island has a delightfully unspoiled cobblestoned village and small empty roads perfect for cycling. Wherever we went in Denmark, we noticed both large and small examples of Danish modern design and engineering, enlightened environmental policy and general rationality. Here’s a small example, our upscale hotel in Copehagen, the Skt. Petri, www.hotelsktpetri.com/hotel.html, supplied condoms along with soap and shampoo. We were so taken with the sleek, simple and efficient shower faucetry at the Falsled Kro hotel on Funen www.falsledkro.dk/homes.html that, when we came home, my husband ordered a set and installed it in our bathroom…an unusual souvenir. We loved the fact that the airport baggage carousels and the escalators had sensors that started the baggage carousel circling or the escalator moving only when a bag or person started to use the equipment. I don’t think I would have chosen to visit Denmark, absent the cycling. But I found it an appealing, enlightened, hospitable…and photogenic country. It was a wonderful trip and Denmark is certainly worth a visit.